Last weekend the annual Stampin' Up! convention was held in Canberra. This convention was for SU demonstrators from Australia and New Zealand, and although I wasn't able to attend, quite a group of lovely ladies from my team were there. By all accounts a fine time was had by all - lots of great awards (congrats ladies), prizes, inspiration, fun and games - well maybe not games, not sure about that bit, but fun anyway. I was very pleased to hear that I had received a sales award, as had my team mate Kelly Chase. Although we didn't get to go up on stage and receive the award from Shelli Gardner - SU head honcho (not being in Canberra made that a little tricky!) we have apparently had our five seconds of fame anyway - with our names up there on the big screen - yay! A big, BIG thank you to all my lovely friends (new and old) and family who have supported my SU ventures over the past couple of years. It is very much appreciated, and I have had a lot of fun along the way. I hope you have too! One snippet of info that has come out of convention, which all of you may be interested in, is about our latest Idea book and catalogue. Having just launched on April 1 2009, this latest catalogue will be current until September next year, rather than March 31, like we all had assumed. The reasoning for this is to help bring all of the SU Markets (NZ/Aust, France/Germany/Great Britain, and US/Canada) more in line. If you are anything like me you will be now suffering from a case of 'What ?!' but the good news is, we will now be having three mini catalogues instead of two, to help get us through until September. 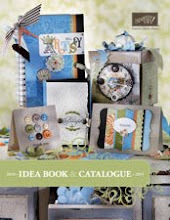 Based on past mini catalogues, it is safe to say the minis will include new stamps, papers, accessories, and possibly new hostess goodies - as if we needed more stuff on our wish lists!